27 Feb 2019 --- Global food and agri-business Olam International Limited has acquired an 85 percent stake in the parent of Indonesia’s largest cocoa processor in a bid to keep pace with demand in the fast-growing Asian market. The Singapore-based global food and agri-business said it would pay US$90 million for the stake in YTS Holdings Pte, the owner of PT Bumitangerang Mesindotama (BT Cocoa). The remaining 15 percent of shares are to be held by the founding members of BT Cocoa, Piter Jasman and family. The acquisition will see production increase, adding 120,000 metric tons of cocoa bean processing capacity and 30,000 metric tons of cocoa mass pressing capacity. This will serve the increasing demand for cocoa products in Asia, particularly for cocoa powder, the company notes. “We plan to rapidly expand our footprint in Asia and develop this business with the founder and family of BT Cocoa. Our relationship will enable us to deliver cocoa ingredients and services to our customer base, as we look to strengthen these relationships in one of the fastest growing regions in the world,” Olam Cocoa CEO Gerard Manley comments. Furthermore, the acquisition satisfies increasing customer demand for full integration within the cocoa supply chain by bringing together Olam Cocoa and BT Cocoa, the largest cocoa processor in Indonesia. BT Cocoa supplies size and scale in Indonesian cocoa processing with a total installed cocoa bean grind and cocoa mass capacity of 150,000 metric tons and a facility equipped with the latest processing technology. “Indonesia has a population of 250 million and a growing middle class with greater spending power who are purchasing more cocoa products. This acquisition strengthens Olam Cocoa’s global supply chain, secures supply for increased production demand and further integrates Olam Cocoa’s supply chain in Indonesia by creating improved market access opportunities for cocoa farmers through dedicated, in-country processing. BT Cocoa brings size and scale in Indonesian cocoa processing with an installed grinding capacity and provides the cost structure to compete and support the growth of Olam Cocoa’s business in Asia,” an Olam Cocoa spokesperson tells FoodIngredientsFirst. Olam Cocoa will continue to be aware of and explore business opportunities that support the business’ strategic and long term growth plans, the spokesperson says. Olam Cocoa has been working with BT Cocoa for nearly three years through a Business Collaborative Agreement and has already made considerable financial and operational improvements, including helping BT Cocoa achieve a 30 percent reduction in energy consumption. This acquisition additionally supports the worldwide positive growth trend of chocolate and cocoa ingredient consumption and the expectation that the need for cocoa processing will continue to grow, supported by additional investment in cocoa producing and consuming countries. The past three years of collaboration has demonstrated the potential for delivering better value. “The combination of Olam Cocoa's expertise as the leading global supplier and processor of sustainable cocoa, with BT Cocoa’s strong local network, will provide our customers with increasing benefits,” Jasman notes. In 2018, global chocolate consumption was above six million metric tons and was expected to increase over the next five years. Indonesia is currently the world’s sixth largest cocoa producing country and Asia is set to become the second largest consumer of cocoa ingredients in the world led by China, India, Japan and the Philippines. 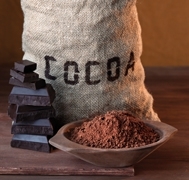 Asian demand for cocoa powder, in particular, is increasing with a five-year CAGR projection of 8 percent. Growth in snack food categories like sweet biscuits and cookies, which accounted for 40 percent of new product development in Asia in 2018, is driving this trend, according to data from Innova Market Insights research.